Alright everyone!! Here is my long overdue update that you have all been asking me for, but don't get used to it cuz it probably won't happen again for a very long time. So much has happened since my last post that I don't even know where to begin. I guess I will start with our move, even though at this point, it is old news. 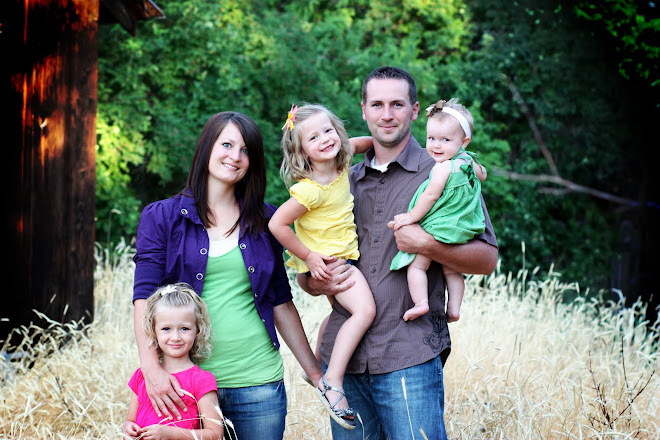 We moved from Cedar City to Vermillion, South Dakota in August 2010 with the help of the Olsen family and Malcolm. It was a long drive but the girls did incredibly well considering they were in a car for 3 days. We had two flat tires on our trailer, but other than that it was pretty much uneventful, which was good. Here's a picture of Ali and Lexie eating popcorn off the ground while Rob changed a tire. Our arrival in South D was super muggy, mosquito infested and we felt somewhat homeless with only a temporary place to stay. However, the small towns here have really grown on us despite the fact that the rivers run in the wrong direction and it is always either too hot or too cold. A local decribed the weather here as a tropical summer and a artic winter. After being here about 6 months I would have to agree. Rob, Aliya, and Ashlyn all had their first days of school at the end of August. Rob started law school, Ali started Kindergarten, and Ashlyn started Pre-school leaving me and Lexie at home wondering what to do with ourselves. The girls love school and both of them are doing great. Ashlyn has learned to write her name and Ali is learning how to read. Here are pictures from their first days of school. Lexie has also had some firsts...she took her first steps and has said her first little words here in South Dakota. Right now she is a big time daddy's girl and quite a wild little women. The girls all dressed up for halloween, and got a whole bunch of candy. My mom, dad, and sisters Amy and Mary came to visit for Thanksgiving. I can't explain how excited my little girls were to see their Grandma Kris, Papa Champ and their aunts. We experienced our first blizzard in the beginning of December. It was crazy-amazing to watch the snow fall in a whole new way than anything I'd ever seen before. Let's just say the snow doesn't come down and lay nice and peacefully on the ground like it does in Utah. I could spend alot of time explaining the snow, but I will spare you and just say you will have to experience it for yourself to know what I am talking about. Christmas came to us here just like it does everywhere else. We had a great Christmas and then spent the New Year in Davenport, Iowa with Steve, Tammi, Scott and the boys. It was so good to be with family. While there with them, we went ice skating and drove across the Mississppi river. We are settled in here, staying busy, and looking foreward to the summer. We are not sure where or what we will be doing then, but one thing I know for sure...it will be warmer!!!! Glad to hear you are all alive and well and haven't frozen to death yet! I love your family pic at the top - so cute! I love all your pictures, your family is so damn cute. Sarah: It is so good to hear from you guys! Your girls are adorable, and it sounds like its not too bad out there! Hopefully your posts will keep coming! Hey!South Dakota, I can't believe it....it is good to see your settling in. I'm excited for you guys. Your girls are adorable. Good to hear what you are up to these days! You're family is growing so fast. Glad to hear that you are doing well.